Here is a Thailand golf post by Gerry Norquist, former Asian Tour star. There is a special magic about playing golf in a Kingdom. 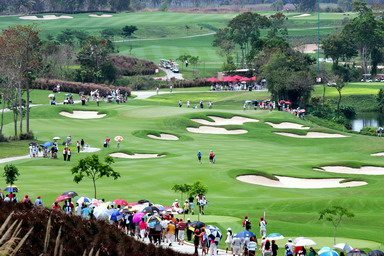 It has been said that the golf experience in “the land of smiles” is like no other anywhere in the world. The many diverse courses available to the golf enthusiast throughout the nation cater to the beginner and the expert with equal delight. A round of golf in Thailand typically begins with a friendly greeting at the club drop off area near the front entrance of the clubhouse. This often times serves as the player’s first meeting with the caddie who will provide guidance, support and countless smiles throughout the coming round.Thai caddies are usually pleasant females who are trained to help with club selection and reading the lines on the putting greens. While not perfect, these caddies are not often wrong and their advice should be trusted by novices and experienced players alike. Many courses in Thailand advocate the use of a golf cart but, with few exceptions, the best experience comes from walking the relatively flat fairways and taking in the sights and sounds of nature. It is not uncommon on any golf course in Thailand to see beautiful birds and butterflies, monitor lizards and even snakesamong the tropical foliage. Not to worry, the caddies seem to always see those before the player and give ample warning to stay clear. There is a particular feeling of relaxation when golfing in Thailand. It might be the friendly caddies who will offer an umbrella to shade the sun or share some of the delicious Thai snacks and fruit they often bring with them. It might be the well-conditioned fairways and greens on the golf courses, due to the perfect growing conditions and excellent weather. It just seems there is a lot more smiling during the day, no matter how well one is playing. Most often, there are several drink huts and food kiosks located throughout the course to offer refreshments at nominal rates. A cold, wet towel greets the golfer taking a short break looking for anything from ice water to a bottle of beer. Thai snacks, sandwiches, fruit and boiled eggs are cheap, quick energy boosters to keep one going in the heat. The pace of play at Thai golf courses is usually pretty good but can slow down on the more busy weekends. The holiday visitor is encouraged to play on a weekday and the green fee will be more pleasing as a result. Advance bookings are a must. There are many services available on the internet for booking tee times, or the concierge of any hotel can help. Upon finishing what is hopefully a successful day on the course, a refreshing shower followed by lunch or drinks is recommended to complete the Thai golf experience. Almost all clubhouses have full service restaurants with traditional Thai and Western menu items available. Find anyone who has played golf in Thailand and chances are they’ll want to play here again. Golf in the Kingdom is truly an experience one won’t forget.